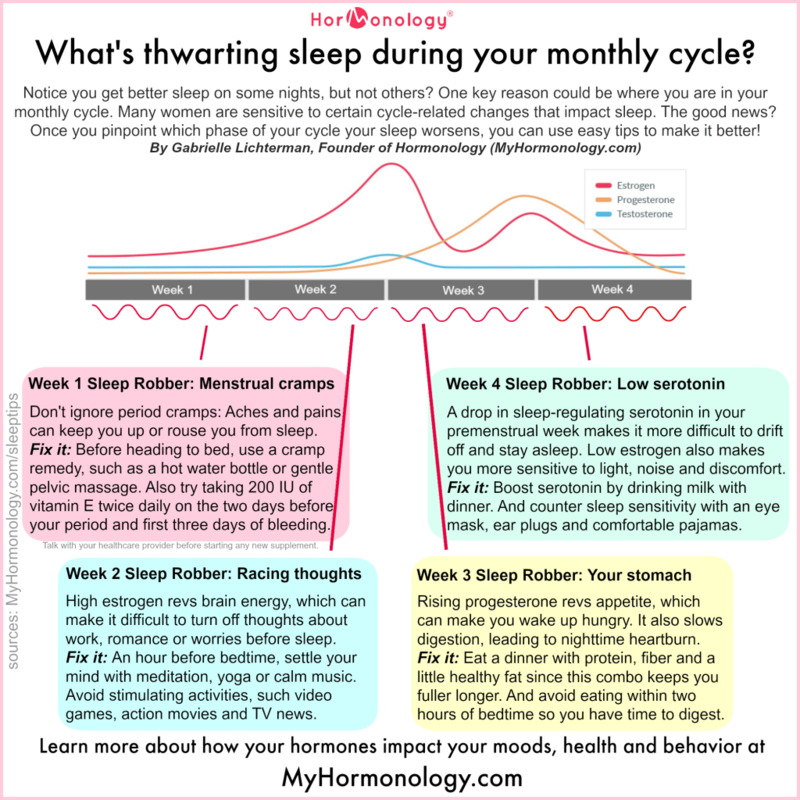 Hormonology Cheat Sheet: What's thwarting sleep during your monthly cycle? What’s thwarting sleep during your monthly cycle? Home > cheat sheet > What’s thwarting sleep during your monthly cycle? 19 Jun What’s thwarting sleep during your monthly cycle? There are lots of benefits to getting a good night’s sleep: It boosts your mood, revs energy and helps keep your immune system strong so you stay healthy. So, it can be frustrating when you have trouble falling asleep or you wake up in the middle of the night and can’t get back to sleep. There are lots of ways you can help ensure a better night’s sleep, such as avoiding caffeine later in the day, exercising regularly and doing what you can to decrease stress. Well, there’s another important way to increase your chances of long, deep sleep: Pinpoint trouble spots in your monthly cycle where you might be more sensitive to certain changes that impact a good night of zzzs. Below is a Hormonology Cheat Sheet that lets you know what could be causing problem sleep in your cycle–along with the fixes to counter them. You likely won’t be experiencing all of these cycle-related sleep woes. But, for the ones you do, knowing why they occur and what to do about them can go a long way toward getting the kind of solid slumber you crave.